Western blot analysis of extracts from Hep G2, A-204, PANC-1 cells using Calnexin (C5C9) Rabbit mAb (HRP Conjugate). 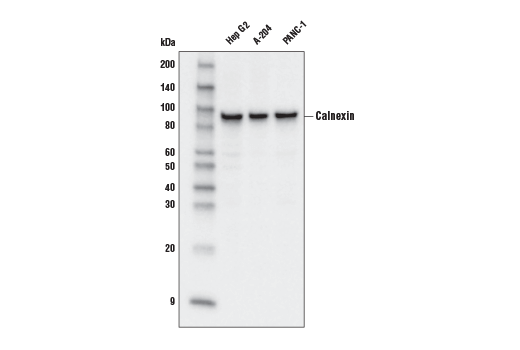 Calnexin (C5C9) Rabbit mAb (HRP Conjugate) detects endogenous levels of total calnexin protein. Monoclonal antibody is produced by immunizing animals with a synthetic peptide corresponding to the sequence of human calnexin. This Cell Signaling Technology antibody is conjugated to the carbohydrate groups of horseradish peroxidase (HRP) via its amine groups. The HRP conjugated antibody is expected to exhibit the same species cross-reactivity as the unconjugated Calnexin (C5C9) Rabbit mAb #2679. Secretory and transmembrane proteins are synthesized on polysomes and translocate into the endoplasmic reticulum (ER) where they are often modified by the formation of disulfide bonds, amino-linked glycosylation and folding. To help proteins fold properly, the ER contains a pool of molecular chaperones including calnexin. Calnexin was first identified as being involved in the assembly of murine class I histocompatibility molecules (1,2). Calnexin is a calcium-binding protein embedded in the ER membrane that retains the newly synthesized glycoproteins inside the ER to ensure proper folding and quality control (3-5). The specificity of calnexin for a subset of glycoproteins is defined by a lectin site, which binds an early oligosaccharide intermediate on the folding glycoprotein (5). Degen, E. and Williams, D.B. (1991) J. Cell Biol. 112, 1099-1115. Ahluwalia, N. et al. (1992) J. Biol. Chem. 267, 10914-10918. Rajagopalan, S. et al. (1994) Science 263, 387-390.